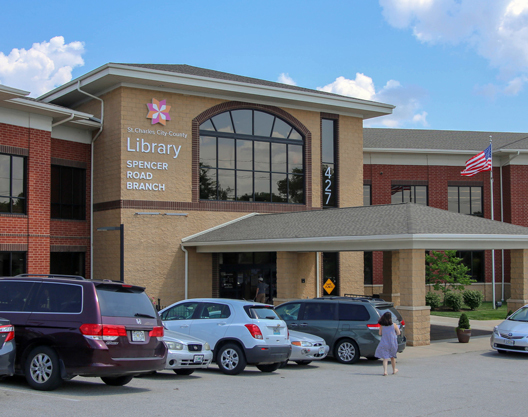 The Spencer Road Branch was one of the first larger branches to be built in the St. Charles City-County Library District. We are very excited having a new, larger library right behind the current location! The old branch opened in 1980; we started building before Spencer Road was paved! After two expansions the library is now a 2 story, 54,701 sq ft building which more than doubles the space of the old. The branch offers a large collection of nearly 200,000 items to customers. Spencer Road is a regional branch and has two special collections: Business & Public Management and Nonprofit Services, both supported by professional staff to assist with questions. We also have a well-loved Children’s area and great collection for teens. We are a very busy branch but are proud of the personal service that we enjoy providing to each customer. Please visit us soon and enjoy our Internet computers, free wifi, quiet study area and programs for adults, teens and kids. We know you will be back again and again. The Spencer Road Branch is pleased to offer the AWE Early Literacy Station, a self contained, educational computer station with carefully selected programs for children aged 2-10. Located in the Children's Department, this touch screen computer contains over 50 top rated fun, educational games. Click here for more information about the AWE Early Literacy Station, or come into the library with your child to check it out yourself!